I’m sure that superficially, we expect someone whose magic works with time, like Teferi, to be strong. Ovid referred to “Time, the devourer of all things”, and it’s true that Teferi’s -3 ability can deal even with Emrakul’s various incarnations. If there’s one thing we’ve learned from science fiction and fantasy, though, it’s that time is dangerous, and judging by Teferi’s abilities, I’m guessing that lore-wise he is holding back from the crazy stuff he witnessed at the Tolarian Academy! I think white-blue control decks are going to be looking at his +1 ability as a major part of their gameplan – Jace Beleren has seen extensive use in defensive decks, and a card-drawing ability that helps them keep mana open for instants to be used during the opponent’s turn is probably a general upgrade. I doubt that his ultimate will be used as much in high-level competitive play, as it requires a more specific setup of cards in hand than other control finishers, but building towards it might help in casual and Commander settings where you’ll always need to deal with enchantments and planeswalkers even when you don’t have the specific spells that address them in hand. 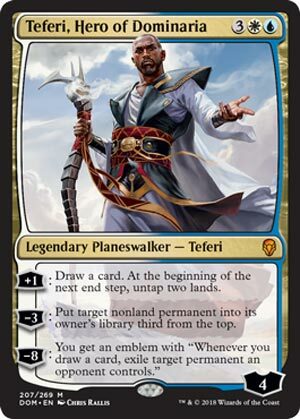 Teferi’s second Planeswalker card, following an appearance in Commander 2014, and his third card overall definitely has the tools to be a force in Standard, even at that “dead zone” Planeswalker cost. He’s not perfect, but what Planeswalker is? The major knock against Teferi is that he has a hard time protecting himself, as his only means of protection is his -3. It’s a powerful piece of protection, though, as it tucks away a problematic permanent for three turns (ideally). He can try to protect himself with his +1, as being able to represent kill spells or countermagic can dissuade people from trying anything funny with him. His ultimate is pretty much apocalyptic, especially in Azorius colors; if you resolve it and weren’t going to die on your next turn, you’re going to win. Particularly if you start knocking out their lands. While Doubling Season is an obvious friend to this Teferi, prison decks can stall out long enough to get to the 8 loyalty needed for his ultimate. I think, like Karn, Teferi’s value lies in his being able to smooth out shaky points in the game; a five-mana removal spell isn’t maybe ideal, but that as Teferi’s worst-case scenario is not an awful worst-case scenario. I’m pretty sure he’ll see play…less than Karn, but still a healthy amount all the same.